Consumer demand is changing at a blistering pace. From the ever-increasing focus on online buying, to the rise of the discount store and consumer drive towards better quality products that cost less, change is constant. For every business in a supply chain, from producers to retailers, this is creating a hair-raising environment in which it’s very easy to go out of favour. This is causing a significant shift in approach to supply chain management – and even what constitutes a supply chain today. Consumer demand is placing pressure on every part of a supply chain to adapt. Organisations that form part of supply chains, whatever their role may be, are feeling the need to become more responsive, to be truly agile in terms of business models and to approach their section of the supply chain in a more innovative way. This has naturally sent many businesses looking inward. Organisations tend to look at their own roles and responsibilities in isolation, finding new ways to adapt and ensure that they are doing better. However, there is an issue with this approach – when the focus is purely on optimising one single part of the supply chain this tends to simply shift costs and consequences on to another level. A lack of holistic perspective can leave parts of the supply chain slow or damaged when, in order to cope with the changes to consumer need and demand, it really needs to function as a whole. Supply chain collaboration was identified as critical to the survival of the entire infrastructure some years ago. However, it’s still proving quite challenging to put into practice. 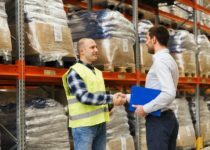 The need to be competitive can sometimes make it difficult to trust supply chain partners and that’s often where collaboration breaks down. The answer to this is either to find neutral partners where trust can be more easily established or to create a situation where the collaboration is mutually beneficial to both parties, providing a greater motivation to trust. A linear approach to supply chain management might be quite traditional but this can also make it almost impossible for collaboration to thrive. Hierarchical, linear models can be isolating and it may be much more beneficial for supply chains to move to a more circular and collaborative approach. It’s essential to recognise the need to create omnichannel solutions today – and that may mean collaboration across a wide range of different parts of the supply chain, from manufacturing and distribution to in-store sales and promotion. What does a more collaborative approach do? There are many potential positive benefits to a more collaborative approach, including reducing waste in the supply chain, making the processes more efficient and finding opportunities for real synergies. It’s also much easier to add value this way. The future of the supply chain lies in a more collaborative approach that recognises the need for omnichannel solutions. At UCS we are always at the cutting edge of issues that affect our industry – find out more about our services here. next post: What initiatives are there that are working to reduce the environmental impact of international shipping?